1989; 30 years ago (1989) from the granting of University status to Queensland Institute of Technology by the Queensland University of Technology Act passed in 1988 and by the merging of Brisbane College of Advanced Education in 1990. In 2015, QUT had enrolled 48,503 students, including 8,218 international students from more than 100 countries, 35,304 undergraduate students, 12,035 postgraduate students and 1,164 non-award students. The university had a total of 4,872 full-time equivalent (FTE) staff members (academic, professional, full-time or fractional full-time and casual) in 2015, and an annual budget of over $900 million. In 2016, the total revenue generated by QUT from its continuing operations was $992.519 million. In 1988, the Queensland University of Technology Act was passed for the grant of university status to Queensland Institute of Technology (QIT). As a result, QIT was granted university status and was operational as Queensland University of Technology (QUT) from January 1989 onwards. Later, the Brisbane College of Advanced Education had joined with QUT in 1990. The Gardens Point campus was once solely occupied by the 19th-century building, the former Government House of Queensland. In 1909, during the relocation of the governor's residence, Old Government House and the surrounding five hectares were set aside for both a university and a technical college. The first university on the site was the University of Queensland which was moved to St Lucia in 1945, where it remains today. QUT has three campuses. Each is a micro-community, with on-campus academic, recreational, and support facilities. Gardens Point campus is located in Brisbane's city centre, beside the Brisbane River and adjacent to the City Botanic Gardens and Queensland Parliament House. At the centre of the campus is the Old Government House which was built in 1862 and re-opened in 2009. The faculties of Business, Law, and Science and Engineering are based at this campus. Gardens Point campus hosts the Gardens Cultural Precinct, comprising the Gardens Theatre and QUT Art Museum, which offer a full theatre and exhibition program. The QUT Art Museum houses the university's art collection, which focuses on contemporary Australian art, including painting, sculpture, decorative art and works on paper. The museum opened in 2000 and attracted about 350,000 people in its first decade of operations. The building is a 1930s neo-classical revivalist building, and the QUT Art Museum was designed by Peddle Thorpe Architects, Brisbane. The Gardens Theatre features professional theatre, children's theatre, and student showcases. The Gardens Point Precinct also comprises a cafe, bar, and free parking. The Gardens Theatre is a medium-sized venue, formerly known as the Basil Jones Theatre, and was renovated with assistance from the Queensland Government. It was reopened as the Gardens Theatre in 1999 by the then Premier of Queensland, Peter Beattie. It provides space for QUT productions and visiting performers, and is the only theatre complex in Brisbane's central business district. The Science and Engineering Centre was completed in November 2012. It brings together teaching and research in science, technology, engineering, and mathematics disciplines. QUT has received both gifts, and federal government funding to support the project's $230 million budget. Kelvin Grove campus hosts the faculties of Creative Industries, Education, and Health as well as the QUT International College and the Institute of Health and Biomedical Innovation. Kelvin Grove campus is connected to the Kelvin Grove Urban Village, a development comprising private residences, education, retail, health, and business in one precinct. QUT Kelvin Grove Health Clinics offer services for free or low-cost to staff, students, and the general public. The Precinct was built at a cost of around $60 million on the site of the Gona Barracks, an Australian Army barracks, which was decommissioned in 1998. The Caboolture campus, located 45 kilometres (28 mi) north of Brisbane, shares its campus with TAFE Queensland. Caboolture campus offers undergraduate degrees in business, education, and nursing, and first-year studies in creative industries. The campus is situated halfway between Brisbane and the Sunshine Coast is convenient for residents of Pine Rivers, Caboolture, Bribie Island, Glasshouse Mountains, and the Sunshine Coast hinterland. On 15 June 2017, QUT and the University of the Sunshine Coast (USC) announced that Caboolture Campus would transfer to USC from 1 January 2018. QUT hosts a small campus in the suburb of Deakin in Canberra. The campus operates on a single floor at the EQ Café Lounge inside the room 'Equinox Business Park' wherein the Executive Master of Business Administration (EMBA) program is taught. Currently, this is the only course being offered by QUT at the Canberra campus. In November 2008, Carseldine teaching, research, and support activities were relocated to Kelvin Grove and Gardens Point campuses. This included the School of Psychology and Counselling and the School of public health and social work, as well as some business, science, and information technology subjects. The campus has since been abandoned and is currently under renovations by the Queensland Government. The Carseldine Urban Village, as set out by the ULDA (Urban Land Development Authority) is what will be replacing the unused campus there. Following QUT's decision to vacate the campus and the lack of a suitable education provider to take over the site, the State Government announced plans to decentralise government services and move around 1000 employees to the remodeled former QUT buildings by late 2012. The QUT Business School has triple accreditation (AMBA, EQUIS, and AACSB). It is placed within the top 1% of Business Schools worldwide. San Jose State University in San Jose, CA, US offers a Ph.D. program in library science in collaboration with Queensland University of Technology. QUT ranks within the top 10 Australian universities by the Excellence in Research for Australia and the Times Higher Education World University Rankings. The university is consistently ranked in the top 12 universities of Australia and among the top 2% universities worldwide by the Times Higher Education World University Rankings, QS World University Rankings and the Academic Ranking of World Universities. In 2015, QUT was ranked 303rd in the world and 9th in Australia by the Consensus World Rankings of Universities, also known as Cube Rankings. In 2016, the university was ranked in the 201st–300th bracket in the world and 8th in Australia by the Academic Ranking of World Universities. The institution was ranked 339th in the world and 10th in Australia in 2016 by the U.S. News & World Report Rankings under the Best Global Universities Rankings category. It was ranked among the top 250 universities of the world in the 201st–250th bracket and 9th in Australia in the 2016–2017 world rankings by the Times Higher Education World University Rankings. In 2017, the university was ranked 298th worldwide, 11th in Australia and 12th in the entire of Oceania region by the Webometrics Ranking of World Universities. In 2018, QUT is ranked 265th globally, 10th nationally and 11th in the whole of Oceania by the Webometrics Ranking of World Universities. QUT was ranked 32nd in the whole of Asia-Pacific region and 10th in Australia in 2017 by the Times Higher Education World University Rankings under the best universities of Asia-Pacific Region category. The university is ranked joint 31st in the entire Asia-Pacific region and joint 9th nationally during the year 2018, 33rd in the whole of Asia-Pacific and 10th in Australia in the year 2019 by the same Times Higher Education World University Rankings under the best universities of Asia-Pacific Region category. It was ranked 378th worldwide in 2017 by the CWTS Leiden Ranking of World Universities published annually by the Leiden University, Netherlands. In 2017, QUT was ranked 205th in the world, 11th in Australia and 12th in the entire of Oceania region by the uniRank World University Rankings. In 2018, QUT is ranked among the world's top 200 universities at 196th position, 8th nationally and 9th in the whole of Oceania region by the uniRank World University Rankings. The university was ranked in the 201st–300th bracket internationally and 11th in Australia in 2017 by the Academic Ranking of World Universities. In 2018, QUT is ranked again in the 201st–300th bracket worldwide by the Academic Ranking of World Universities. The university is ranked 331st in the world and 12th in Australia for 2018–19 by Turkey's University Ranking by Academic Performance (URAP). QUT is ranked in the top 250 universities globally at 247th place in the 2018 world rankings by the QS World University Rankings. The university is placed in the 201-250th bracket worldwide and 9th in Australia in the 2018 world rankings by the Times Higher Education World University Rankings. QUT is ranked 281st in the world in the 2018 world rankings by Russia's Round University Ranking (RUR). It is ranked 168th in the world by the RUR Reputation Rankings. The university is ranked 241st internationally and 9th nationally in the 2018–19 world rankings by the Saudi Arabia's Center for World University Rankings. QUT is ranked in the top 250 universities worldwide in 244th position and 12th in Australia in the 2019 world rankings by the QS World University Rankings. The university is again ranked in the top 250 universities globally in the 201st–250th bracket, 12th in Australia and 12th in the entire of Oceania in the 2019 world rankings by the Times Higher Education World University Rankings. QUT was ranked as Australia's best university under 50 years of age in 2013 by the Times Higher Education World University Rankings in the THE Top 100 Under 50 years World Young University Rankings category, which was placed at No.1 position in Australia and ranked 26th internationally in that category. In 2016, it was ranked 28th globally in the THE Top 150 Under 50 years World Young University Rankings category and in 2017, it was ranked 24th worldwide in the THE Top 200 Under 50 years World Young University Rankings category by the Times Higher Education World University Rankings and both times secured the second-highest and top 2 position in Australia. QUT is ranked 20th worldwide in the year 2018 by the THE Top 250 Under 50 years World Young University Rankings. QUT is ranked 19th in the world for the year 2019 by the QS Top 50 Under 50 years World Young University Rankings. Since 2013, QUT has been ranked within the top 3 young universities nationally and among the top 35 young universities of the world (2013(26), 2014(31), 2015(33), 2016(28=), 2017(24), 2018(20)) as per the Times Higher Education World University Rankings in the THE Top 200 Under 50 years World Young University Rankings category. Since 2013, the university ranks within the top 3 young universities of Australia and among the top 30 young universities of the world (2013(23), 2014(28), 2015(20), 2016(18), 2018(18=), 2019(19)) as per the QS World University Rankings in the QS Top 50 Under 50 years World Young University Rankings category. In 2017, QUT was ranked 6th in Australia and 7th in the entire of Oceania region by the QS World University Rankings in the QS Graduate Employability Rankings category and ranks among the world's top 100 universities in the 61–70 bracket globally in the same category. As per the 2018 graduate employability world rankings, the university is ranked 9th in Australia and 10th in Oceania region and in the world's top 120 universities in the 111-120th bracket worldwide by the QS Graduate Employability Rankings. QUT is ranked in the top 110 universities worldwide in the 100-110th bracket, 9th in Australia and 10th in Oceania for the year 2019 by the QS Graduate Employability world rankings. It was ranked in the top 5 universities worldwide in 2017 by the Center for World University Rankings in the subject areas of Ergonomics (2) and Transportation (3) under the Center for World University Rankings by Subject category. The university was ranked 1st in Australia and 24th globally in the subject area of Communication and Media Studies by the QS World University Rankings by Subject 2017. It was ranked 8th nationally and 38th worldwide in the subject area of Nursing as per the QS World University Rankings by Subject 2016. It was ranked 4th in Australia and 65th in the world in the subject area of Computer Science by the Times Higher Education World University Rankings by Subject 2017. QUT was the only non-Go8 university ranked in Australia along with three other Go8 universities by the Times Higher Education in the top 100 universities worldwide in the subject area of Computer Science in 2017. It is ranked again in 2018 among the top 100 universities of the world at 98th position and 4th in Australia in the subject area of Computer Science by the Times Higher Education World University Rankings by Subject 2018. As per the QS World University Rankings by Subject 2017, QUT was ranked within the top 50 universities worldwide in the subject areas of Mineral & Mining Engineering (40=), Art & Design (41), Nursing (42=) and Education (45). It was ranked within the top 100 universities worldwide in Social Sciences & Management (98=) and in the 51–100 bracket globally in the subject areas of Architecture, Engineering – Civil & Structural, Law, Performing Arts, Social Policy & Administration and Sports-Related Subjects. It was ranked within the top 150 universities globally in Engineering & Technology (113=) and in the 101–150 bracket worldwide in the subject areas of Accounting & Finance, Business & Management, Computer Science & Information Systems, Environmental Sciences, Mathematics, Sociology and Statistical & Operations Research. It was ranked within the top 200 universities worldwide in Arts & Humanities (171=) and in the 151–200 bracket globally in the subject areas of Engineering – Electrical & Electronic, Engineering – Mechanical, Aeronautical & Manufacturing and Psychology. It was ranked within the top 300 universities globally in Life Sciences & Medicine (266=) and in the 251–300 bracket worldwide in Biological Sciences. QUT is ranked 10th in Australia and in the 176–200 bracket worldwide in the subject area of Life Sciences by the Times Higher Education World University Rankings by Subject 2018. The inductees are announced at a gala event each year in July. Since 2014 the QBLHOF has also awarded an annual Fellowship, to recipients working on a research project that utilises the resources of the John Oxley Library to produce new interpretations of Queensland's business history. The QUT Library provides learning and research support to students and staff. There are three library branches at QUT: Gardens Point library, Law library, Kelvin Grove library. In addition to borrowing and information access services, the QUT library also offers specialised support for coursework students, academic staff and researchers. The QUT library has a resource budget of approximately $13 million to buy subscription to academic journals and other materials. QUT Library provides the 3rd largest collection of ebooks and online video of any Australian or New Zealand university library. The QUT library hosts a number of institutional repositories. QUT is a world leader in the area of open access. In 2003, it became the first university in the world to adopt an institution-wide Open Access policy, mandating the deposit of research papers in its institutional repository, QUT ePrints. QUT Digital Collections, managed by QUT Library, brings together digitised and born digital collections for dissemination to and reuse by the global community. When possible, items will be made open access and available via a Creative Commons license. Please see individual resources for specific copyright, license and access information. QUT Digital Collections is built on EPrints repository software. For a more comprehensive list, see List of Queensland University of Technology people. ^ a b c d e "QUT Annual Report 2017" (PDF). Queensland University of Technology. Archived (PDF) from the original on 11 August 2017. ^ "QUT leaves Australian Technology Network". Times Higher Education. ^ "QUT leaves ATN". Queensland University of Technology. ^ "Cultural diversity". Queensland University of Technology. Archived from the original on 6 October 2016. ^ a b "QUT - At a glance". Queensland University of Technology. Archived from the original on 6 September 2015. ^ "Why Choose QUT?". Queensland University of Technology. Archived from the original on 6 October 2016. ^ "Australian Higher Education Providers - Finance 2016" (PDF). Australian Department of Education and Training. Archived (PDF) from the original on 9 April 2018. ^ "QUT - 2017 Annual Report" (PDF). Queensland University of Technology. Archived (PDF) from the original on 11 August 2017. ^ Beattie, Peter (7 August 2000). "Cabinet Endorses Key City West Project" (Press release). Archived from the original on 11 March 2012. ^ "Changes to Caboolture campus: QUT and USC agree on Caboolture Campus transition". Queensland University of Technology. Archived from the original on 13 March 2018. Retrieved 15 June 2017. ^ "QUT Canberra Executive Education Centre". Queensland University of Technology. Archived from the original on 31 March 2017. ^ "QUT Equinox Business Park - Deakin Suburb - ACT". Queensland University of Technology. Archived from the original on 31 March 2017. ^ "QUT Canberra Campus". Queensland University of Technology. Archived from the original on 31 March 2017. ^ "Carseldine Urban Village". 2008. Archived from the original on 20 March 2012. Retrieved 23 June 2016. ^ "Government offices planned for former Carseldine QUT campus". Bayside and Northern Suburbs Star. 26 October 2010. Archived from the original on 25 April 2013. ^ "Triple crown accreditation". Queensland University of Technology. Archived from the original on 12 March 2017. ^ "University rankings". Queensland University of Technology. Archived from the original on 12 March 2017. ^ "More about Queensland University of Technology". Times Higher Education. Archived from the original on 19 August 2017. ^ "PHD program". SJSU Gateway. Archived from the original on 2 December 2013. Retrieved 1 January 2014. ^ "Graduate Employability Rankings 2016". Quacquarelli Symonds Limited. ^ "CWUR 2016 - World University Rankings". Center for World University Rankings. ^ "CWUR 2016 - Top Universities in Australia". Center for World University Rankings. ^ "All unis winners in research audit". News Corp Australia. Archived from the original on 4 August 2017. ^ a b "World University Rankings 2016-2017". Times Higher Education. Archived from the original on 31 December 2016. ^ a b "Best universities in Australia 2018". Times Higher Education. Archived from the original on 21 December 2016. ^ a b c "Times Higher Education World University Rankings 2018". Times Higher Education. Archived from the original on 6 September 2017. ^ "Queensland University of Technology". Australian Universities. Archived from the original on 21 June 2017. ^ a b "QS World University Rankings 2018". Quacquarelli Symonds Limited. Archived from the original on 9 June 2017. ^ "A world-class university". Queensland University of Technology. Archived from the original on 6 October 2016. ^ a b "Academic Ranking of World Universities 2017". Shanghai Ranking Consultancy. Archived from the original on 19 January 2015. ^ "Consensus World Rankings of Universities 2015". Cube Rankings. Archived from the original on 3 March 2017. ^ "Academic Ranking of World Universities 2016". Shanghai Ranking Consultancy. Archived from the original on 22 September 2017. ^ "Education Rankings 2016". www.university-list.net. Archived from the original on 3 March 2017. ^ "Times World University Rankings 2016-2017". Times Higher Education. Archived from the original on 31 December 2016. ^ "Ranking Web of Universities 2017 - Australia". Cybermetrics Lab. Archived from the original on 3 July 2015. ^ "Ranking Web of Universities 2017 - Oceania". Cybermetrics Lab. Archived from the original on 18 May 2017. ^ "Ranking Web of Universities 2018 - Australia". Cybermetrics Lab. Archived from the original on 3 July 2015. ^ "Ranking Web of Universities 2018 - Oceania". Cybermetrics Lab. Archived from the original on 12 November 2017. ^ "Best universities in the Asia-Pacific region 2017". Times Higher Education. Archived from the original on 5 July 2017. ^ "Best universities in the Asia-Pacific region 2018". Times Higher Education. ^ "Best universities in the Asia-Pacific region 2019". Times Higher Education. ^ "CWTS Leiden Ranking 2017 - World". www.UniversityRankings.ch. Archived from the original on 16 January 2018. ^ "uniRank World University Rankings 2017 - World". uniRank. Archived from the original on 1 September 2017. ^ "uniRank World University Rankings 2017 - Australia". uniRank. Archived from the original on 1 January 2007. ^ "uniRank World University Rankings 2017 - Oceania". uniRank. Archived from the original on 1 September 2017. ^ "uniRank World University Rankings 2018 - World". uniRank. ^ "ARWU Australian Universities World Rankings 2017". Australian Education Network. ^ "ARWU Shanghai Academic Ranking of World Universities Australian Rankings 2017". Australian Education Network. Archived from the original on 8 April 2015. ^ "University Ranking By Academic Performance 2017-2018". Informatics Institute of Middle East Technical University. ^ "Round University Rankings - World". Round University Ranking. ^ "Round University Rankings - RUR Reputation Rankings". Round University Ranking. ^ "CWUR World University Rankings 2018-2019". Center for World University Rankings. ^ "Times Higher Education World University Rankings 2019". Times Higher Education. ^ Remeikis, Amy (20 June 2013). "QUT the nation's best university under 50". The Brisbane Times. Fairfax Media. Archived from the original on 21 December 2013. ^ "World's top 100 universities under 50: ranked by Times Higher Education". Guardian News and Media. The Guardian. 20 June 2013. Archived from the original on 27 March 2017. Retrieved 26 March 2017. ^ a b "Times Higher Education 250 Under 50 Rankings". Times Higher Education. ^ "QS Top 50 Under 50 Years 2019 World Rankings". Quacquarelli Symonds Limited. ^ Cooper, Nathanael (7 April 2016). "University rankings: QUT named among best in world". The Brisbane Times. Fairfax Media. Archived from the original on 28 February 2017. Retrieved 27 February 2017. ^ "Times Higher Education 150 Under 50 Rankings". Times Higher Education. Archived from the original on 7 April 2017. ^ Mitchell-Whittington, Amy (6 April 2017). "Brisbane uni storms up rankings to make top 25 in global list". The Brisbane Times. Fairfax Media. Archived from the original on 6 April 2017. Retrieved 7 April 2017. ^ a b "Times Higher Education 200 Under 50 Rankings". Times Higher Education. Archived from the original on 5 April 2017. ^ "QS Top 50 Under 50". Quacquarelli Symonds Limited. Archived from the original on 25 July 2017. ^ "QS Graduate Employability Rankings 2017". Quacquarelli Symonds Limited. Archived from the original on 2 October 2017. ^ "Graduate employability ranking: the best university for getting a job". The Guardian. Guardian News and Media. 22 November 2016. Archived from the original on 27 February 2017. Retrieved 26 February 2017. ^ "QS Graduate Employability Rankings 2018". Quacquarelli Symonds Limited. Archived from the original on 30 October 2017. ^ "10 of the Best Australian Universities for Graduate Employability in 2018". Quacquarelli Symonds Limited. Archived from the original on 12 September 2017. ^ "QS Graduate Employability Rankings 2019". Quacquarelli Symonds Limited. ^ "CWUR Rankings by Subject 2017". Center for World University Rankings. Archived from the original on 22 May 2017. ^ a b "Why Choose QUT? - A world-class university". Queensland University of Technology. Archived from the original on 6 October 2016. ^ a b "Times World University Rankings 2016-2017 by subject". Times Higher Education. Archived from the original on 27 October 2016. ^ "Why Choose QUT? - A world-class university". Queensland University of Technology. Archived from the original on 6 October 2016. ^ "Best Universities in the world for Computer Science Degrees 2017". Times Higher Education. Archived from the original on 10 October 2017. ^ "Times World University Rankings 2018 by subject". Times Higher Education. Archived from the original on 22 January 2018. ^ "THE - Best universities for computer science degrees 2018". Times Higher Education. Archived from the original on 10 October 2017. ^ a b c d e "QS World University Rankings by Subject". Quacquarelli Symonds Limited. Archived from the original on 11 March 2017. ^ "Times World University Rankings by subject 2018". Times Higher Education. Archived from the original on 9 November 2017. ^ "Queensland Business Leaders Hall of Fame". Queensland Business Leaders Hall of Fame. Archived from the original on 6 August 2017. Retrieved 6 August 2017. ^ QPM. "Annual reports". www.library.qut.edu.au. Archived from the original on 8 September 2015. Retrieved 15 January 2016. ^ Cochrane, Tom (16 June 2014). "Why open access is the next frontier for science". Australian Broadcasting Commission. Archived from the original on 5 July 2014. 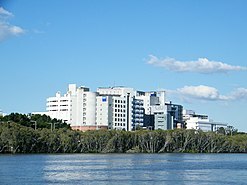 Wikimedia Commons has media related to Queensland University of Technology.